This mirror is unusual as the carved figure is that of a 'shishi' (Japanese temple dog) rather than the more commonly seen dragon: the shishi being the head of a lion and the body of a dragon, with an open mouth it is thought they ward off evil spirits. 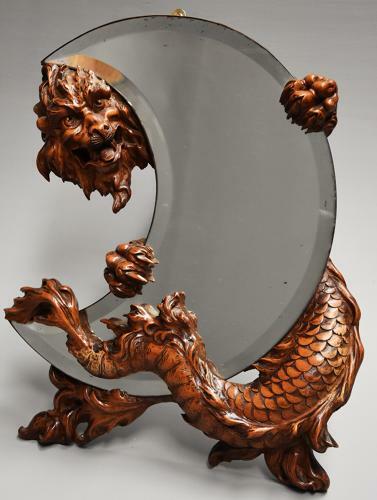 This decorative mirror consists of a superbly carved walnut shishi supporting the mirror plate with his feet and tail, the bevelled crescent shaped mirror plate being original with pine back to the reverse. It appears this mirror was originally a dressing table mirror but has been converted at some time over the years to a hanging mirror. Similar examples of the carved shishi can be found on the exquisite daybed by Viardot. Although we cannot find any evidence of signature on this cabinet it has many elements of a Viardot piece and is certainly a piece of superb quality, design and workmanship. This mirror is in excellent condition for age, is of stable construction and can go straight into a home.